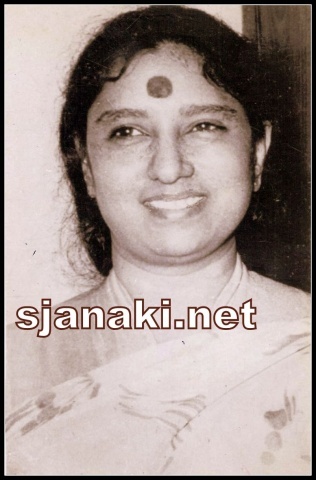 Janaki sang in around 17 languages. Although her career best were in Malayalam,Kannada,Tamil and Telugu ,She has some memorable numbers in other languages like Hindi,Oriya,Tulu,Sinhalese as well. She sang few Hindi songs in dubbed version of Telugu movies like Bhaktha Prahladha,Maya Maschindra etc.. but Bappi Lahri gave her a big break with Yaar bina Chain kahare in Saheb.He came to Chennai for a recording where he listened to Janaki’s famous Hindi songs with Bhupinder in a Tamil movie called Nandu and he decided to make her a part of his team . He gave some good scores to her like Dil Main Ho thum(Sathyameve Jayathe) ,Aaya jab se thu dil main Aaya (jhoothi). She sang with Popular singers like Kishore Kumar , Mannadey and budding stars like Udit narayan,Kumar Sanu ,Amit Kumar etc..in music of Lakshmi kanth Pyarelal,Anu Malik ,Ilayaraja etc.. But She had to give up Hindi songs as she was getting extremely good songs in south and it was very difficult to manage both . She won Sur Singar award for Pag Paadam song which was originally composed by SPB in Telugu and was reused by Lakshmikanth Pyarelal in Nache Mayuri .She sang in Sinhalese , tulu etc.. in very beginning days of her career itself. Ilayaraja made her sing German in one of his movies. Voice Modulation for Various ages has been one of the best points of her singing . She sang songs for almost every age of woman’s life from child hood to a old age and at the same time she excelled in singing a boy’s and Man’s voice . Ilayaraja , explored her Voice in every aspect and she was very determined to make his every experiment a grand success. Her Smile/laugh, Sensuous Notes,Alaap/Hummings added beauty to several compositions especially during 70′s and 80′s . Some songs ran forever in radios just for her humming.Even her cry/Weep was very sweet in some songs and mainly SPB and Janaki mastered every expression possible in Cinema Music. In a career spanning more than 50 years with over 30 years of extreme success , She sang duets with more than 100 famous singers in various languages.Not only singers, She had duets with Heroes,Comedians,Music Directors as well .Voice Modulation according to situation is her biggest asset. Versatility of her singing ! !